When you wake up on a Monday you never really know all you are going to see and experience before you do it again. But when you pay attention, each collection of days sing with its own tone and tenor, drawing your attention to certain well worth noting things. This week has been especially like that. I had breakfast this morning with my friend Joey Chambers, the driving force behind an annual mission trip to Costa Rica. 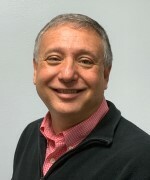 I was one on one with a man who is definitively in touch with his connecting point to the Kingdom of God at large. What becomes evident when you talk with him is that his commitment to change lives in a place where God is working has certainly changed one particular life; his own. It has given birth to new passion, priority, and purpose. And it has become contagious among the folks with whom he and Stephanie do life. Funny how that works. I’m looking forward to seeing how that keeps working. 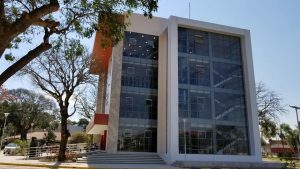 Earlier this week The Evangelical University of Bolivia dedicated its new medical science building. I was on the ground in Santa Cruz with my friend Jeff Prine when the work was being fashioned. It is the crown jewel of a partnership involving architecture, medicine, agriculture, leadership, and pastoral education. Somewhere along the line, Jeff felt a heart tug that just would not let go of him. So like a bulldog, he would not let go of it. This one-time Louisiana farm boy has invested a big chunk of the last two decades using his architectural skills to leave kingdom investments that will change lives for years to come. And he invited (read dragged) dozens of people with the specific skills to extend the effort – I know because I was one. And whose life got changed the most? Jeff would tell you in a minute it was his. So would I, because I knew him before. This week also brought two way too early deaths of special people. Erin Kitzinger, a remarkably kind and courageous lady, lost her fight with cancer in a way no one saw coming. Nothing good about that. It’s more than heartbreaking for Linda and Dennis and the rest of the family. But I’ve seen a community of faithful friends gather around to make sure they do not travel the road of grief alone. 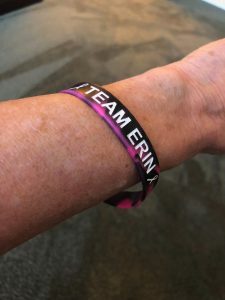 Dozen’s of folks have worn rubber bracelets with Erin’s name and the admonition to “Fight Like a Girl.” My Lord how she did. Life brings grief to all of us in one way or another. It’s a road you cannot travel alone. And the Zwiefel’s won’t for a lot of reasons; chiefest being that the people of God who so love them won’t let them. As I write this I am loading up to head to the funeral of my friend Art Cleveland. We met at FSU in the early eighties. Our paths paralleled each other to central Florida, Louisville, and eventually back to Florida again. Gentle. Funny. Brilliant. Opinionated. Joyful. Gracious. Those are just the first few words that come to mind as I think of him. 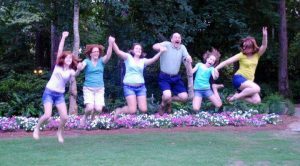 Art’s Christian calling was to be a therapist for children, extolling the joyful medium of playing as a path to healing and wholeness. “You’ve got to play to make it today” he often said, knowing that most people don’t. Art believed that children look for father figures everywhere. 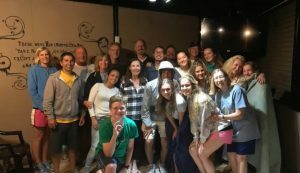 So as a therapist and father of four girls, he exported his considerable insight and encouragement to over 4000 of them through his “DADS Project.” I stand amazed at the ripple effects of his 61-year life. He was loved and admired by so many, especially by those fortunate enough to have called him friend. One of the great blessings of my life was that for the better part of four decades, from time to time he called me the same. What a week. And it’s only Thursday.